BANDAGE SCISSORS ARE SHARP AND DURABLE WITH THE ABILITY TO CUT THROUGH MULTIPLE LAYERS OF CLOTHING OR BANDAGES. THE BANDAGE SCISSORS ARE 7 1/2 INCHES WITH A BLUNTED TIP TO PREVENT THE PATIENT FROM BEING POKED OR SLICED BY THE SCISSORS. THEY CAN BE USE BY LEFT AND RIGHT HANDED USERS. LISTER SCISSORS FEATURE A CLIP ON THE SIDE OF THE SCISSORS FOR CONVENIENCE. THEY ARE ALSO SHARE AND DURABLE WITH THE ABILITY TO CUT THROUGH MULTIPLE LAYERS OF CLOTHING OR BANDAGES. 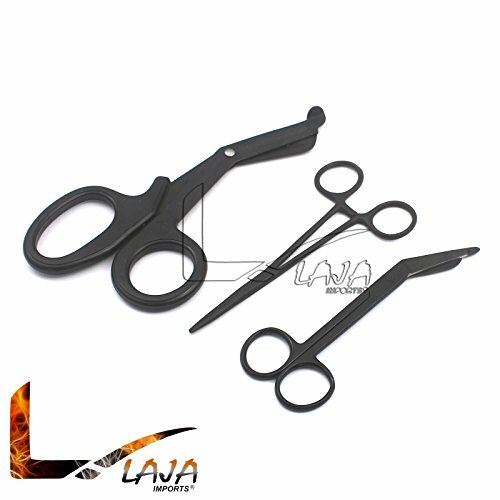 THE LISTER SCISSORS ARE 5 1/2 INCHES AND MADE OF STAINLESS STEEL WITH A BLUNTED TIP TO PREVENT THE PATIENT FROM BEING POKED OR SLICED BY THE SCISSORS. HEMOSTATS ARE DURABLE CLAMPS WITH A LOCKING FEATURE TO ENSURE A TIGHT GRIP. THEY TOO ARE MADE OF STAINLESS STEEL AND ARE MADE OF THE HIGHEST QUALITY TO ENSURE PERFORMANCE AND SATISFACTION.